There is a bit of confusion, even among experts, about the difference between a bungalow and a craftsman style home. Some people say the term “bungalow” is all about size, not architecture or interior design. Others, believe that bungalow is a generic term associated with houses built during the Arts & Crafts movement. Architects often say the design and construction — an open floor plan, low-profile and the essential over-size front porch — define a bungalow home. Almost everyone agrees that the bungalow style gets its most basic features from the “Bangla” style — small homes built during the British Empire rule in Bengal, India. Bangla homes were single-story dwellings that featured shaded verandas and either tile or thatched roofs. Although many people used the terms “craftsman” and “bungalow” interchangeably, a bungalow is a type of dwelling, whereas craftsman refers to a particular architectural style. So, it is possible to have a craftsman bungalow, but not all bungalow homes reflect the craftsman style. Today, we see many two-story craftsman style homes, with the quintessential simplicity and easy-care design. When considering replacement window styles and accessories, simplicity is usually the best approach. Mimicking the original design may include the “instantly-recognizable” divided-light windows with the crisscrossed corners, or another simple pattern. Most, if not all, older craftsman homes feature double-hung windows with a 4-over-1, or 6-over 1 sash construction. Original wood windows were all true-divided lite windows built by joining smaller panes with mullions or sashing strips. This remains the most popular grille pattern for homeowners updating with modern, high-performance replacement windows in our area. Don’t Forget the Patio Door or Side Porch Entrance! People who plan to replace patio doors, will want to install either a hinged-French style replacement patio door or a glider designed to look like a French style door. And, remember to add a complementary grille pattern to continue the theme. Because homes built during the early craftsman movement feature built-in cabinetry and other fine details, homeowners generally prefer to match their replacement window interior finishes to existing trim and cabinets. Here, removable, natural wood interior grilles are the best option. They easily snap on and off for easy cleaning and repainting as needed. If you’re planning to update your New Jersey or New York Metro home with replacement windows and patio doors, we can help. 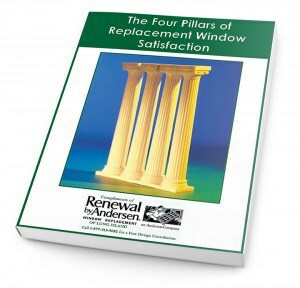 Even if you’ll still just thinking about your options, we invite you to fill in the short form on this page to request a brochure, or dial 1-888-826-2451 to schedule a private consultation with a replacement window specialist in your own home.